The past few weeks have appeared more reminiscent of the middle of winter than the beginning of March, even with the first day of astronomical spring just around the corner. Within the span of 11 days, there have been three nor’easters that have impacted many areas within the region, making it difficult for some to keep up with the snow removal process. Worcester, MA has already received 40 inches of snow in March, making it their snowiest first half of the month on record. Erie, PA, and Islip, NY, also had their snowiest start to March. 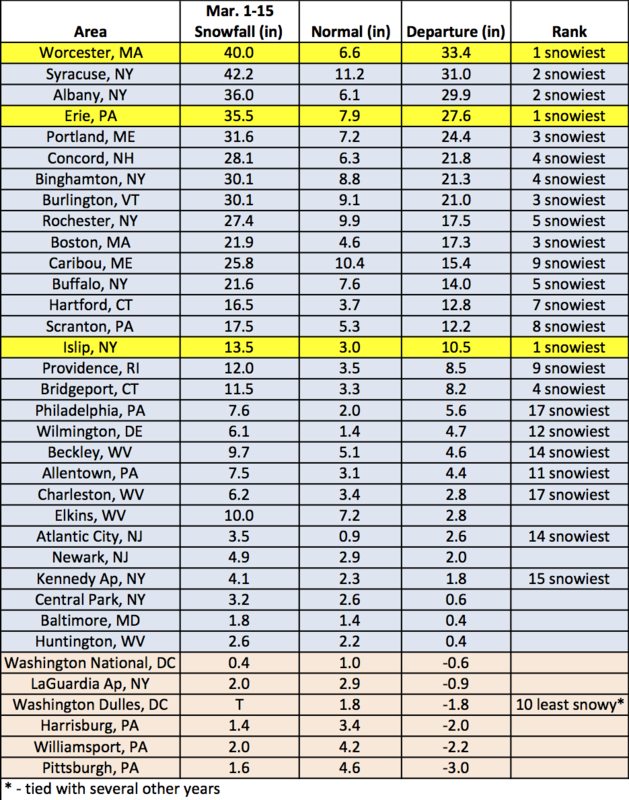 Another 21 sites ranked this first half of March among their 20 snowiest. Even with the parade of coastal storms, not all areas have seen above-normal amounts of snow, especially locations around Pennsylvania and Washington, DC. With the three back-to-back nor’easters, New York and New England have received much more snow than normal so far this month. 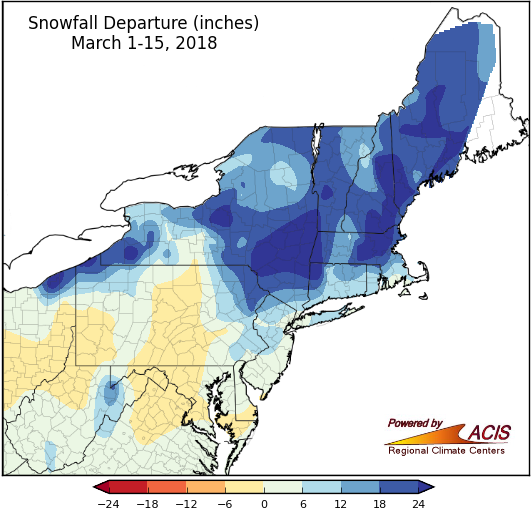 Snowfall totals for the beginning of March have ranged from 40 inches in Worcester, MA, which is 33.4 inches above normal, to just a trace near Washington, DC. 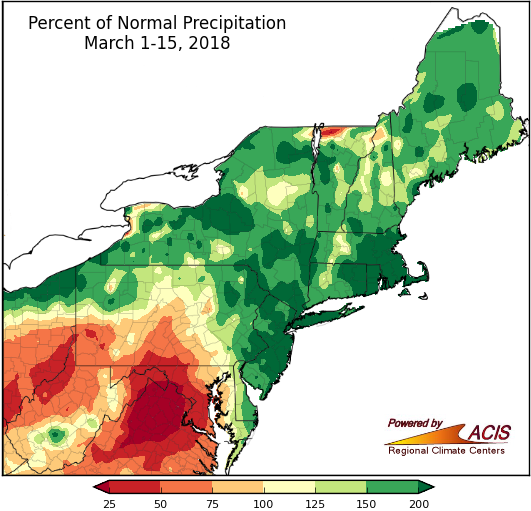 Most of the 35 major climate sites in the Northeast have experienced wetter-than-normal conditions, mainly as a result of the nor’easters that have moved through the region. The wettest areas were generally found in New England and New York. 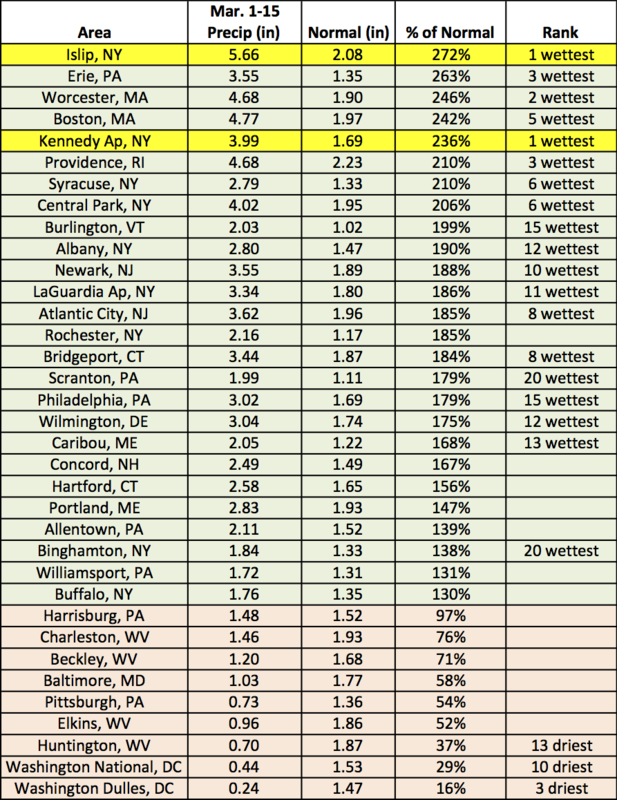 For the first half of March, Islip, NY along with Kennedy Airport each experienced their wettest conditions on record, but for other areas towards the south, it was a very different story. Washington, DC, and parts of West Virginia have received less than an inch of rain so far this month. Precipitation has generally been above normal except for areas in (and south of) Pennsylvania. Climate sites on Long Island have received record amounts of precipitation, with Islip, NY recording 5.66 inches, 272% of normal, within the first 15 days of the month. Overall, 19 sites ranked this first half of March among their 20 wettest. Temperatures during the first half of March have varied greatly. Even with the series of storms, many locations in northern New England have experienced warmer-than-normal temperatures. Caribou, ME had a departure from normal of 9.6°F, making this the fifth warmest start to March on record for that area. 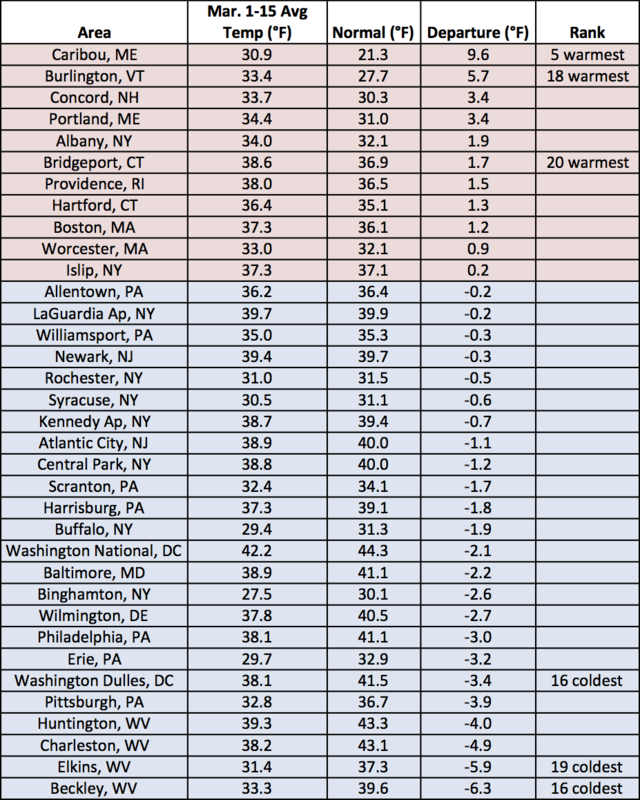 Climate sites south of New York have largely had days with cooler-than-normal temperatures during the beginning of the month. 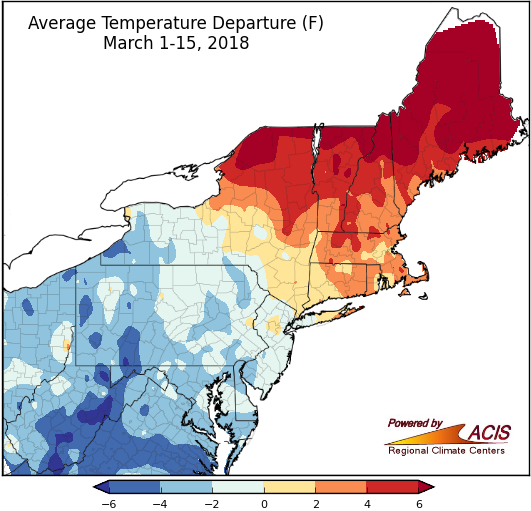 Temperature departures in northern New England have been above normal, but most areas south and west of New York City have recorded departures on the cold side of normal. Temperature departures have ranged from 9.6˚F above normal in Caribou, ME to 6.3˚F below normal in Beckley, WV during the first part of the month.